The words, written in big, white, Impact letters, caught my attention as I scrolled idly through Facebook a few months ago: “IF YOU REMEMBER THIS, THEN YOUR CHILDHOOD WAS AWESOME.” They were superimposed on an image that did instantly remind me of something: the SuperPlayground, a wooden play structure in a small park in my hometown, which was torn down and replaced several years ago. 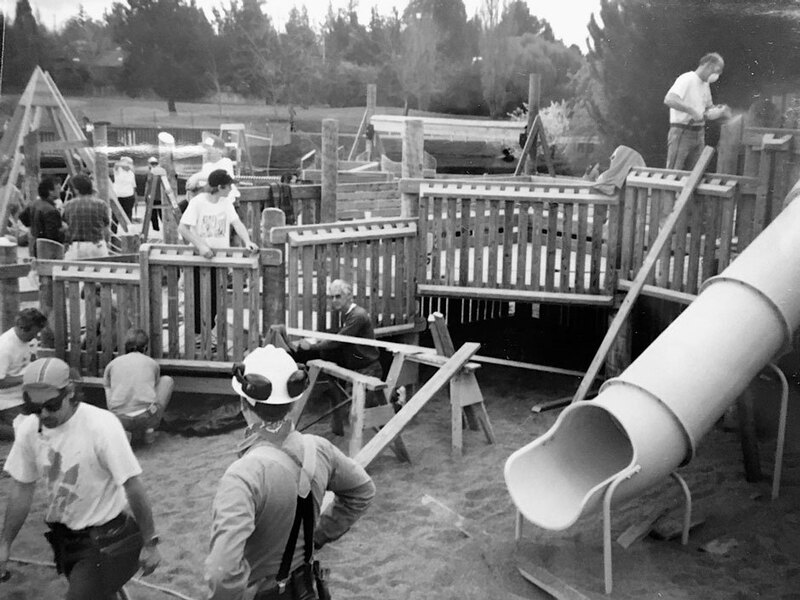 In the small, lefty community of Sebastopol where I grew up, in the wine country north of San Francisco, there were many playgrounds, but the SuperPlayground was everyone’s favorite. Whimsical details like a dragon slide, pyramid-framed swings, and pointed wooden towers separated it from the many plastic and metal pre-fab structures elsewhere around town. But best of all were the “secrets” the structure held: the wooden tunnels underneath it big enough only for young children, the corner where a PVC pipe embedded in the wall allowed you to whisper to your friend across the park. There were always places to hide and discover away from prying adult eyes. To find out, I had to go back to the 1970s in Ithaca, New York, when a young architect built his first playground inspired by his children’s ideas, to the early 1980s, when the playground safety movement began (with a brief swing by Mr. Rogers' Neighborhood), and to the early 1990s, when a woman in my hometown threw herself wholeheartedly into the construction of the park we loved so much. Bob Leathers grew up in Maine, building his own rafts and treehouses with a gaggle of other boys. Leathers had always been creative, and after graduating from Rhode Island School of Design in 1965, he moved to the West Coast, where he worked at an architectural firm and facilitated community projects. But Leathers didn’t build his first playground till he moved back east to Ithaca in 1970. His project, building a playground at his children’s school, had a few unique features. Firstly, no one got paid. Second, the kids’ imaginations drove the design. These two ideas planted the seeds of the mission Leathers and his nascent company pursued for the next thirty years. After helming the creation of about five playgrounds a year through the seventies, Leathers began to incorporate the work into a company, Leathers and Associates, in the early 80s. “One of the beauties of doing it community-built, as I do it, is that I never sat down and designed the process,” Leathers told me. Yet, over the years, as Leathers’ projects spread across the country and even around the world, the communities he worked with helped him develop a formula. First, a community member would recruit him to build a playground. Though some of his projects have been partially funded by a town or county government, almost all of them relied on fundraising. Leathers, and eventually the company he started, Leathers and Associates, gave communities suggestions on how to raise the funds necessary to get their project off the ground. This was often an overwhelming process, including everything from selling personalized fence posts to penny drives at local businesses. Leathers or an employee of his would travel to the town for a “design day”, where he’d visit local schools and solicit drawings and ideas from children. 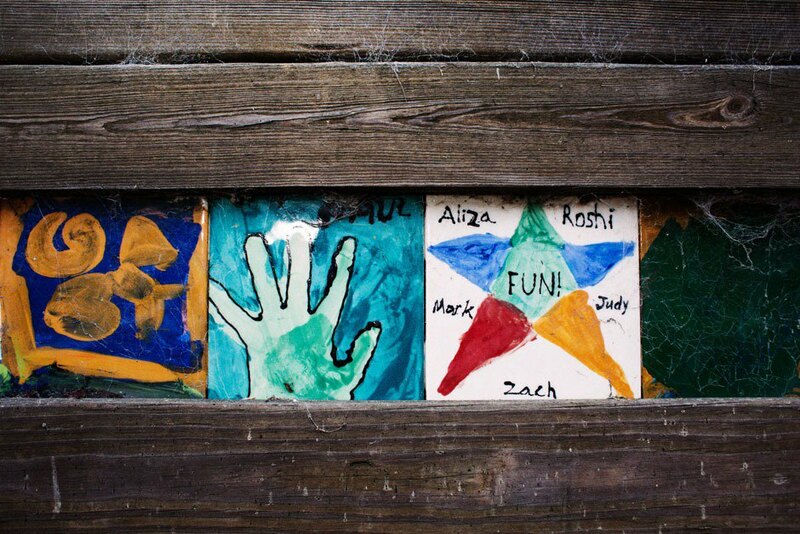 These would be incorporated into a playground design based around a similar basic structure, but personalized by the children’s ideas in that specific community. “When it first started, let's just say the third playground I ever did, if a kid had said, ‘I want to have a castle like at Disneyland,’ my response then would've been, ‘It's impossible to build a castle with a whole bunch of volunteers,’” Leathers says. “After having done 500 or so, I kept hearing ‘castles,’ I kept hearing ‘spaceships,’ I kept hearing ‘tree houses,’ I realized it may be [possible], and [we] evolved into it.” Leathers found cheap ways to create abstracted representations of kids’ fantasies that they could use to play however they wanted. After the design day, preparation would begin for the build. A sort of modern-day barn raising, builds generally require about five days of ten-hour shifts and often necessitate thousands of volunteers. Tools and other supplies were sometimes donated to keep costs as low as possible. To coordinate and fund all this activity, volunteers running these projects donated months or even years of their lives to making these projects happen. Knowledge of Leathers’ work has largely spread by word of mouth. His fame reached its peak in 1986 when he made a cameo on an episode of Mr. Rogers' Neighborhood. The last time the New York Times wrote about him was in 1989. Yet since the ‘70s, his company has built well over 2,000 playgrounds, both in the United States and places like Israel and Australia. For the communities that build Leathers’ playgrounds, and particularly for the volunteer leaders who are central to the process, the projects can be life-altering. 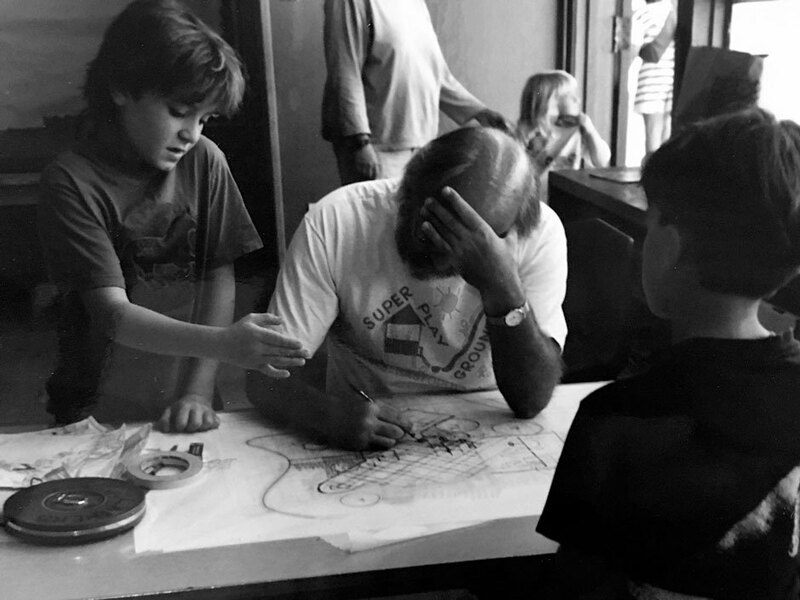 In some communities, his playgrounds have lasted more than 20 years, providing a landscape for multiple generations to play. Another defining feature of Leathers’ structures is their material: wood. “If you're going to fall and hit something, would you rather hit wood, or concrete, or steel? It's forgiving for kids playing on it,” Leathers says. Wood is also cheaper than a lot of the more modern materials made specifically for playgrounds, and, as Leathers notes, the farmed wood his company uses is environmentally friendly. Wood is also “volunteer-friendly”. “These playgrounds are built by volunteers who aren't familiar with sophisticated construction techniques, but most people can use a hammer and many people can use a saw,” he says. But wood has a downside—it must be maintained by the same community that helped to build it. And it ages. This is the difficult result of Leathers’ vision: the playgrounds which take a miracle to build, often bringing a community together as nothing has before, creating life-long friendships and altering careers, don’t last all that long. In many places, Leathers playgrounds are disappearing. Leathers or an employee of his would travel to the town for a “design day”, where he’d visit local schools and solicit drawings and ideas from children. Sebastopol, CA, 1992. Photo Courtesy of Kim Camp. A sort of modern-day barn raising, builds generally require about five days of ten hour shifts, and often necessitate thousands of volunteers. Sebastopol, CA, 1992. Photo Courtesy of Kim Camp. To coordinate and fund all this activity, volunteers running these projects donated months or even years of their lives to making these projects happen. Sebastopol, CA, 1992. Photo Courtesy of Kim Camp. “If I had known what I was going to endure, I probably never would have done it,” says Kim Caruso, now Kim Camp, the volunteer who spearheaded the SuperPlayground project in my hometown, Sebastopol. As a mother in 1992, she was in school to complete a degree. Her sister lived by a Robert Leathers playground in Vermont and it inspired her to take on a playground project in Sebastopol for independent study credit. As with Leathers' other projects, Camp’s extensive fundraising and planning culminated in a five-day build, bringing thousands of volunteers together to saw, hammer and supervise construction (Camp asked me to emphasize that many others helped with the project, including a committee). This included a crew of a dozen volunteer foreman, who were in charge of supervising the site from morning to night. The project ended up being a major turning point in Camp's life. “Once you build something, it's like, you get it. You need to take care of it for life,” Camp says. The SuperPlayground launched her career as a community leader. For years after, she worked at the Sebastopol Community Center building other community-led projects like tennis courts and gazebos, while remaining in charge of the maintenance of the playground. “I think we did a heck of a job keeping up with it. I really do. If it wasn't safe anytime, we'd close it, we'd rope it off, we'd fix it right away. 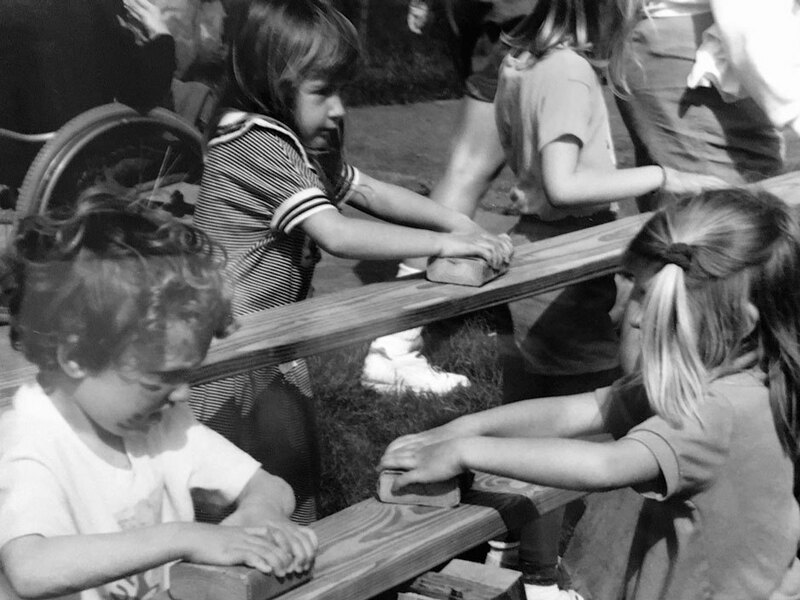 We had to reseal the playground[‘s wood] once a year, so we would organize like 60 people for the day. I had people that would help me do food. We’d have music,” Camp remembered. Of the more than 2,000 playgrounds built by Leathers and Associates, Leathers estimates that about 1,500 are still standing. The internet is littered with stories of those that have been taken down or rebuilt. 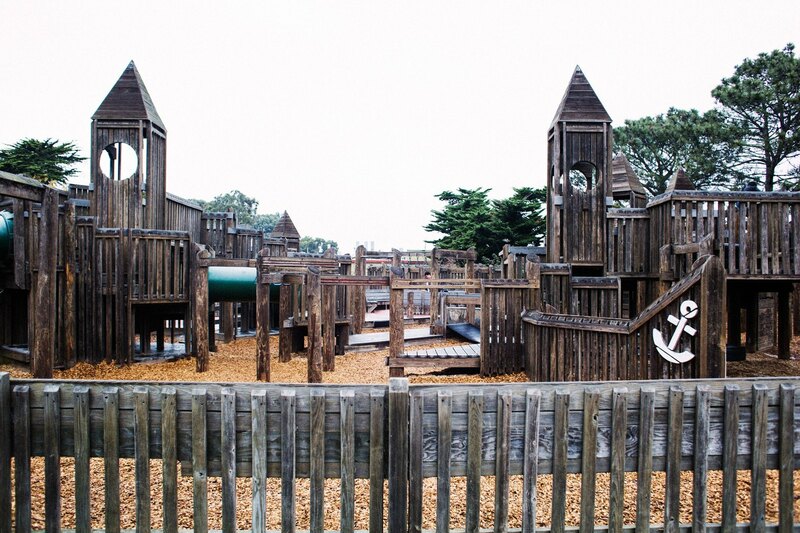 Over the past few years, worries about wooden playgrounds have intensified, as parents grew concerned that arsenic or other chemicals contained in the sealant could be leaking into the ground. Other safety regulations, such as those requiring specific surfacing to prevent injuries from falls, also impacted Leathers’ playgrounds. The company has adapted their materials and designs to suit these changes. But with the older playgrounds, it can be difficult for volunteers, like Camp, to keep up. Hard as it is to believe, playground safety has only really existed as a concept since the early 1980s. In 1981, just as Leathers’ playgrounds were flourishing, a spate of highly publicized playground injuries prompted the first playground safety guidelines from the U.S. Consumer Safety Commission. Throughout the 80s, fear of accidents snowballed, as more and more parents sued cities and states for their children’s injuries. A few crusaders, including consumer advocate Theodora Briggs Sweeney, turned up the pressure on playground designers, local governments and manufacturers to create safer playground equipment. 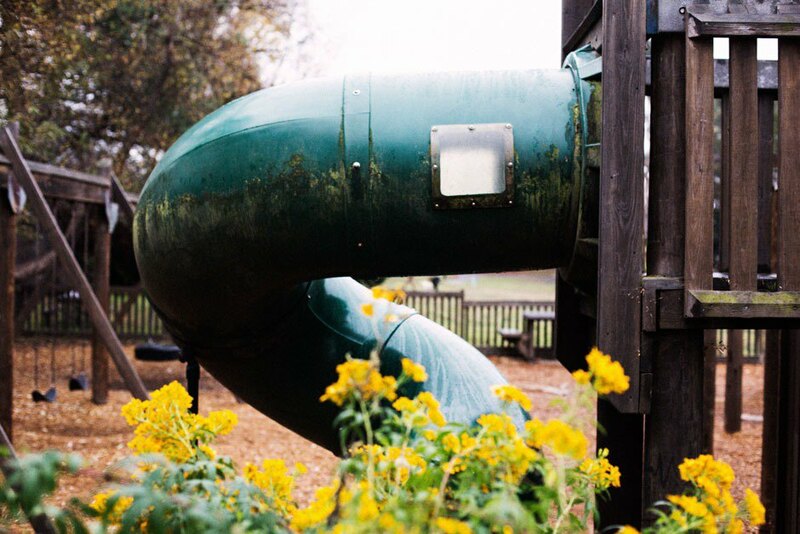 Many parks removed materials and structures considered dangerous, including anything that could entangle a child and installed softer surfaces, replacing concrete with rubber or wood chips. A large body of research has proven that children today are given less freedom by their parents than previous generations. In 1972, geographer Roger Hart conducted a famous study, measuring the distances that children in a small New England town traveled outside their homes, producing maps that showed the average distance most children were allowed to stray, and how far they actually went. When he returned to the same town in 2004 and caught up with the now-grown children he’d studied to see how they were raising their own kids, he found his experiment impossible to repeat: the parents barely trusted their children to go outside their sight, not to mention to be followed on unsupervised adventures around the town. A backlash to the phenomenon of “helicopter parents” and “overprotected children” (as journalist Hanna Rosin calls them) has taken shape over the last few years, resulting in the concept of “free range” kids, who are given a longer leash by their parents, coming into vogue as a child rearing practice. Some parents today are leaning towards allowing their children experiences that more closely resemble the unsupervised freedom they had while growing up. One of the more radical results of this movement has been the resurrection of “adventure playgrounds”, a largely lost tradition started in post-World War II England. Adventure playgrounds resemble junk yards in which kids have near total freedom and are given permission to take risks that would give most 21st century parents a heart attack. They light fires, use real tools like saws and hammers, climb trees and play in the mud. Adventure playgrounds employ “playworkers”, who are highly trained to supervise children from a distance, encouraging them to take measured risks and learn from the consequences. Filmmaker Erin Davis is the creator of a short documentary about a UK adventure playground called The Land. Watching the film, which features scenes of children lighting fires with wet cardboard and engaging in other precarious behavior, is simultaneously nostalgic, heartwarming, and nerve wracking. Not everyone sees the advent of greater parental and governmental involvement in play negatively. 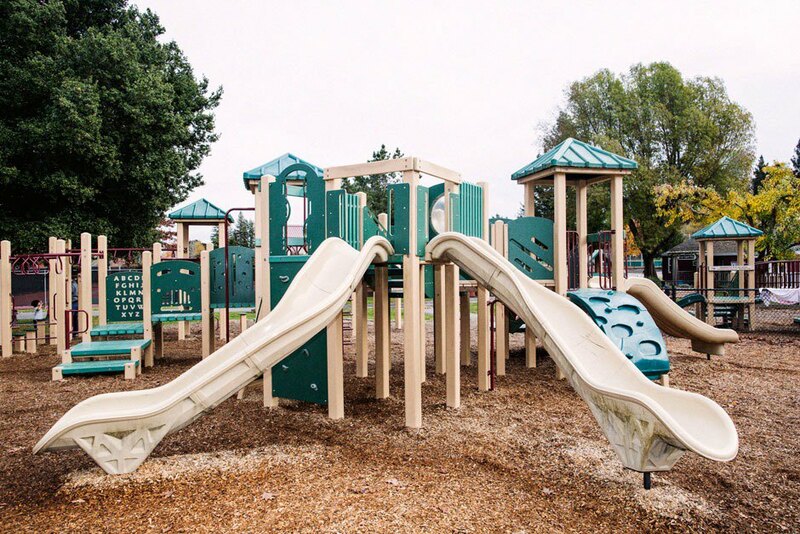 National Recreation and Parks Association playground safety expert Caroline Smith doesn’t see the last few decades of playground safety regulations as increasingly stringent, but as a natural progression adapting to the information on injuries and accidents that has become available over time. “We had the reporting, so [regulators] were able to identify where injuries were occurring. [The regulations] have just gotten more specific,” she says. 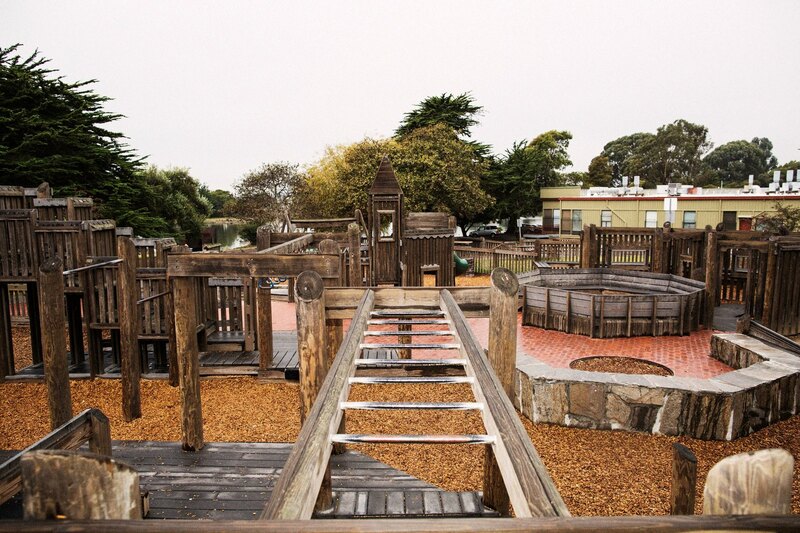 Bob Leathers knows about the challenges his older playgrounds are facing. “They have a life depending on how well a community takes care of a project. What that really means is that some projects have only lasted about 10 years. Other projects are still going strong today that were built 20 and 25 years ago. It's a question of how well they're taken care of, how tough the use, the weather and the community,” he says. Playground safety expert Smith believes that it’s possible to both fulfill the requirements of safety and to create challenging play spaces though sometimes the desire for safety can make people lazy. “I hate to see people take the easy way out and say, you know, you can make your playground safe by making everything only four feet high. Sure, you could do that, but you’re not really hitting all the important parts of having a playground, the benefits of having a challenging equipment and challenging opportunities,” she says. Cheryl Leathers told me something similar. “Playgrounds are about taking risks, but you want them to be safe risks. That's pretty complex to deal with,” she said. “You know, safety is a myth,” she adds. 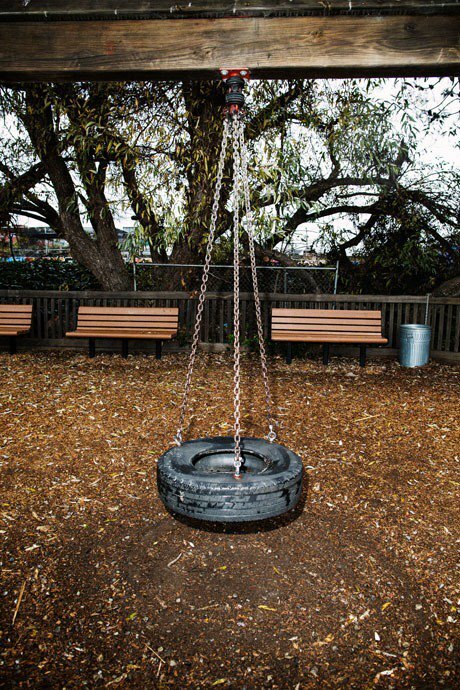 Davis’ argument for giving children greater autonomy reminds me of my own experiences at the SuperPlayground. 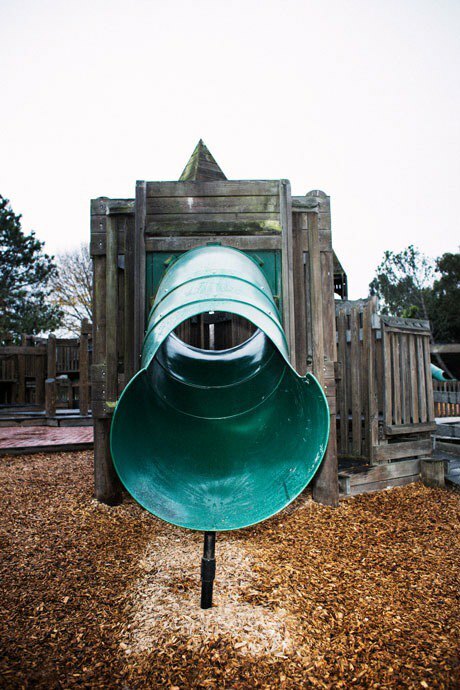 It wasn’t the slides, swings or other standard playground equipment that I found so compelling about the park, but the child-sized mazes and hiding spaces that seemed to belong to only us kids, where adults couldn’t come in and tell us what to do. It’s not that Leathers and Associates don’t focus on safety—Bob Leathers himself sat on the National Playground Safety Committee for several years, and his website says that all their designers and construction consultants are Certified Playground Safety Instructors—but their playgrounds allowed the possibility of risk, of invention and of a world that belonged to children alone.